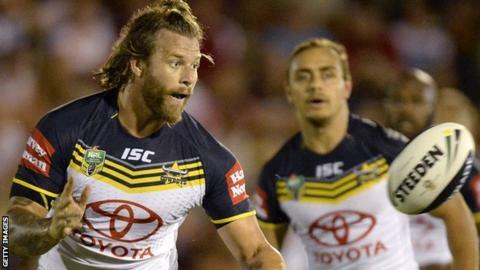 Warrington Wolves prop Ashton Sims says head coach Tony Smith was key to him moving to Super League from Australia. The 29-year-old Fiji prop has just started pre-season with the Wolves after signing on a two-year deal from NRL side North Queensland Cowboys. Sims made his debut for St George Illawarra in 2003 and has also played for Brisbane Broncos. Asked what was behind the move, Sims said: "Probably just talking to Tony Smith during the year." He told BBC Radio Merseyside: "Just his passion and love for rugby league and Warrington. "We're not oblivious to the Super League over in Australia. I know Warrington made the last two Grand Finals before this year and they were a strong club. "If I can bring anything to the team that would be great, and that's what Tony thought, I could bring something to the team." Australia-born Sims was the eldest of three brothers to represent Fiji at the 2013 World Cup, qualifying to play for the country through his Fijian mother. "North Queensland were great to me, my family and my brother was up there too, so they were a really family orientated club," he added. "That's exactly what I've found here in Warrington - they've made my move over here so easy and I'm totally indebted to them."